A hand-held device used for testing blood in sick people is being assessed in Canada to see if it can be used to test a horse’s fitness performance and athletic capacity. 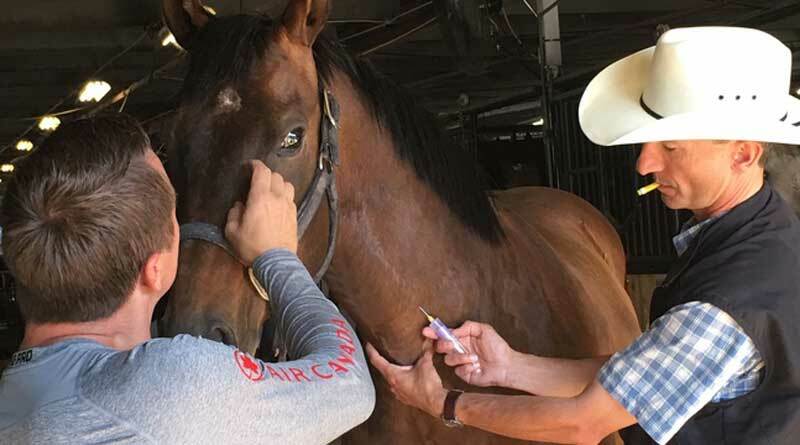 The device, which measures ammonia levels in the blood, is being eyed for its potential to assess horses competing in the annual Calgary Stampede, and perhaps further afield. “We have a hand-held analyzer that has not been validated for veterinary use and we need to prove its accuracy in measuring blood ammonia in horses,” explains Dr Renaud Léguillette, an equine internal medicine professor with the University of Calgary’s Faculty of Veterinary Medicine. “Ammonia is tied to anaerobic metabolism — how much power is delivered to the muscles without using oxygen. It’s a little like blood lactate but it’s more specific for assessing athletic performance,” he says. Higher ammonia levels mean a horse is using more anaerobic power. “We think that in horses it could have a benefit for assessing fitness performance and maybe even as a performance indicator eventually in the future,” Léguillette says. The test is simple. The blood sample is put on the strip and assessed by the device in three or four minutes, delivering a stall-side device. Léguillette and his research team are testing several chuckwagon horses competing in this year’s Rangeland Derby races at the Stampede. Blood is taken from horses at rest before the chuckwagon races for baseline testing and again immediately after the races. He is working with a leading biochemist at Calgary Laboratory Services to perform rigorous testing of the hand-held tool, comparing its results against “gold standard” laboratory equipment. Léguillette, who is chairman of equine sports medicine at the university, says the chuckwagon drivers are welcoming of the research and the sampling of their horses. “It’s a little bit humbling,” says Mark Sutherland, a veteran professional chuckwagon driver whose horses are involved in the research. For Léguillette and other researchers from the university, having the Calgary Stampede as their research grounds is an unparalleled opportunity for a veterinary faculty. And the Stampede finds the relationship equally valuable.